Rasulullah SAW Teaches The Path of Dakwah Islamiah. Towards Fulfilling the Fara'idh of Islam. 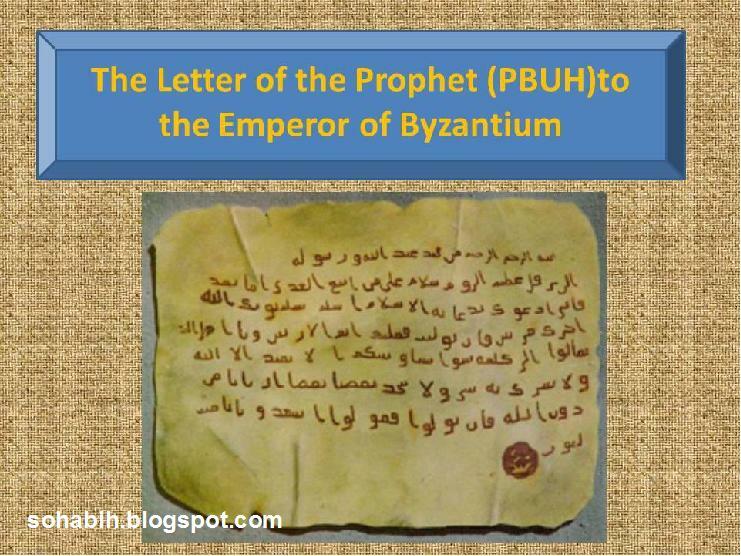 Howshab Dhi Dhulaym RA narrates that when Allah SWT granted dominance to Rasulullah SAW, he sent a letter with Abd Sharr and a band of forty horsemen to Rasulullah SAW. When they arrived in Madinah, Abd Sharr asked, "Which of you is Muhammad?" when someone pointed Rasulullah SAW out to him, he asked "What have you brought to us? I am willing to follow you if it is good." Rasulullah SAW said to him, "You should establish solah, pay zakah, safeguard the blood of people, enjoin good and forbid from evil." Rasulullah SAW Calls the Abd Qais Delegation. Abdullah bin Abbas narrates that when a delegation from the Abd Qais tribe met Rasulullah SAW ,he said to them, "Welcome to people who shall suffer neither remorse hor humiliation (in both worlds because they had accepted lslam willingly)." he said, "0 Rasulullah SAW!The Mushrikeen tribe of Mudhar (who are famous war-mongers) live between yourself (Madinah) and us. We are therefore able to meet you only during one of the sacred months (during which they do not fight). We request you to inform us of something excellerite that will lead us to Jannah when we carry it out and towards which we may call our people who have remained behind." Rasulullah SAW! said to them, "I command you to do four things and forbid you from four things. (The things that I command you'to do are) To believe in Allah SWT by testifying that there is none worthy of worship but Allah, to establish solah, to pay.zakah, to fast during the month of Ramadhan and (an additional thing is) to pay one third of the spoils of war (to the public treasury). I forbid you from the following four things: From the drinks brewed in utensils made from marrow, utensils made from hollowed trunks, utensils that are oiled and green in colour and utensils covered in tar (therefore the drinks brewed in all these utensils cannot be consumed because they become intoxicating)." Another narration Q) mentions that Rasulullah SAW, "Always bear this in mind and convey the message to those of your people who remained behind." The Hadith of Aqamah RA. Concerning the Reality of Iman, Giving Da'wah towards Iman and the Fara'idh. "Every statement has a reality (to substantiate it). What is the reality of your Iman?" They replied, "Fifteen attributes (prove the existence of our Iman). Five are those that you have commanded us to do, five are those that your .messengers have commanded us to do and five are those that we have adopted from the Period of Ignorance and are still practising until now unless you forbid us from them 0 Rasulullah SAW. Rasulullah SAW asked, 'What are the five that I have commanded you to do?" They replied, "You have commanded us to believe in Allah, in His angels, His books, His Arnbiyaa and in the predestination of all good and evil." Rasulullah SAW asked, "What are the five that my messengers have commanded you to do?" They replied, "Your messengers have commanded us to testify that there is none worthy of worship but the One Allaah Who has no partners and that you are Allah's servant and Rasul. Furthermore, they instructed us to establish the obligatory solah, to pay the obligatory zakah, to fast during the month of Ramadhaan and to perform Hajj to the Kabah should we have the ability to do so." Rasulullah SAW asked, "And what are the attributes that you have adopted during the Period of Ignorance?" They replied, "Expressing gratitude when enjoying good fortune, exercising patience when experiencing difficulty, speaking the truth during occasions of confrontation, being happy with the decrees of fate and not expressing pleasure when an enemy is afflicted by calamity." (Addressing the Sahabah RA , Rasulullah SAW exclaimed, "Intellectuals and well-cultured people! Their manners are close to those of the Ambiyaa because they are so excellent." Rasulullah SAW then smiled with them and said, "I shall advise you with another five attributes s o that Allah SWT may complete your excellent attributes. Never store that which you cannot eat, never build that which you cannot live in, never compete to achieve that which shall have to leave behind tomorrow, fear that Allah SWT to Whom you shall have to go before Whom you shall be gathered and concern yourselves with that towards which you are heading and where you shall live forever." Suwayd bin Haarith RA narrates that he was one of seven person who met Rasulullah SAW as a delegation. When they arrived in his presence and spoke to him, he was impressed by their mannerisms and appearance. Rasulullah SAW asked them, "What are you?" They replied, "Mu'mineen." Rasulullah SAW said, "Every statement had a reality (to substantiate it). what is the reality of your Iman?" They replied, "Fifteen attributes (prove the existence of our Iman). Five are those that your messengers have commanded us to believe in, five are those that your messengers have commanded us to carry out and five are those that we have adopted from the Period of Ignorance and are still practising until now unless you dislike them (in which case we are prepared to forsake them). .." The rest of the Hadith is similar to the one mentioned above except that in place of "predestination of all good and evil", he mentioned, "resurrection after death" and instead of "not expressing pleasure when an enemy is afflicted by calamity", he said, "steadfastness when enemies rejoice at our misfortunes." A Hadith has already passed earlier in which an unnamed person from the Baladawiyyah tribe narrates the following conversation between his grandfather and Rasulullah SAW: asked, "To what are you calling people?" "I am calling the servants of Allah to Allah," Rasulullah SAW responded. "What have you to say?" I asked further. He said, "That you should testify that there is none worthy of worship but Allah, that Muhammad is the Rasul of Allah, that you believe in everything revealed to me, that you renounce Laat and Uzza and that you establish Solah and pay zakah." What is Zakah?" I asked. "Wealth that our rich give to our poor," came the reply. I responded by saying, "These are excellent things you are calling towards." 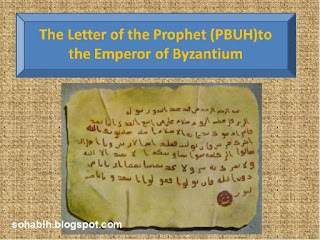 Rasulullah SAW, Sends Letters to Many Kings and Kingdoms. 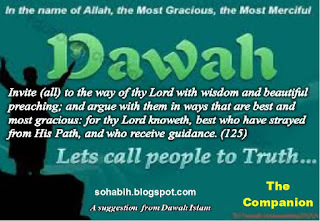 Towards Allah and Towards Accepting Islam Rasulullah SAW Dispatches the Sahabah RA to Faraway places and and Encourages them to give dakwah but not to Fall into Disputes. Miswar bin Makhrama RA, that Rasulullah SAW narrates once came to the Sahabah RA and said, "Allah has sent me as a mercy to all of mankind. Execute this responsibility on my behalf and Allah SWT shall shower you with mercy. 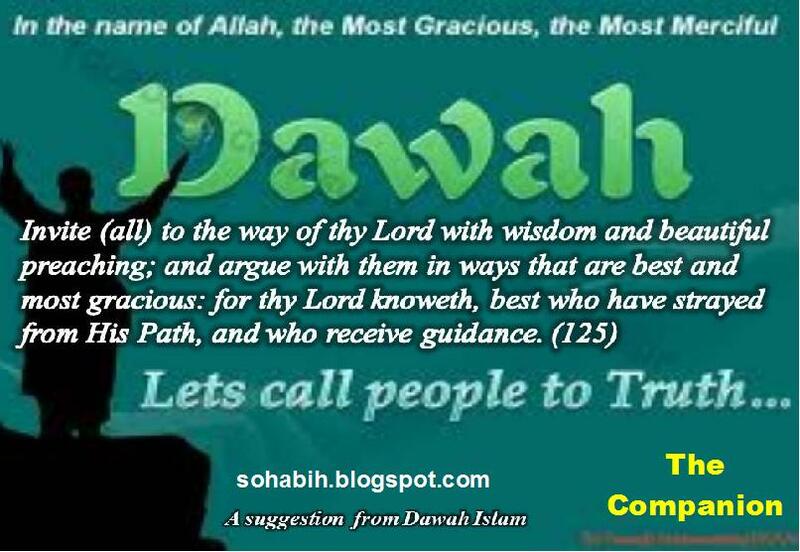 Isa AS also placed a similar request to his disciples (to propagate the message far and wide) so do not fall into disputes as they fell into before him. Those of them who were sent to far places disliked it (while only those sent nearby were prepared to do as asked) so Isa AS prayed to Allah about this. The next day, Allah made each one of them speak the language of the people to whom he had been sent (to propagate the religion). Isa AS then addressed them saying, "Allah has made this task incumbent on you, so ensure that you carry it out." The Sahabah RA said, "0!! Rasulullah SAW , We shall certainly execute the responsibility on your behalf so send us wherever you like. Rasulullah SAW then sent Abdullah bin Hudhafa RA to Kisra (the Emperor of Persia) while Saleet bin Amr RA was sent to Howdha bin Ali the chief of Yarmamah, Alaa bin Hadhrami RA was sent to Mundhir bin Saawa the chief 'of Hajar and Amr bin Al Aas RA was sent to Jaifar and Abbad the two sons of Julunda who both ruled over Amman. In addition to these messengers, Dihya Kalbi RA was sent to the Caesar (Emperor of Rome), Shuja bin Wahab Asadi RA was sent t o Mundhir bin Haarith bin Abi Shimar Ghassaani and Amr bin Umayyah RA was sent to Najaashi (the King of Abyssinia). All of these messengers returned before the death of Rasulullah SAW except Alaa bin Hadhrami RA who was still in Bahrain when Rasulullah SAW passed away. ans have mentioned that Rasulullah SAW also sent Muhaajir bin Abi Ummayyah RA, to Haarith bin Abd Kulaal while Jareer RA was sent to Dhul Kulaa, Saa'ib RA was sent to Musalama and Haatib bin Abi Balta'ah RA was sent to Maqowqis (the king of Egypt). Anas RA narrates that before the demise of Rasulullah SAW he also sent letters tto emperors of Persia, Rome and Abyssinia as well as to every dictatorial leader, inviting them towards Allah The Glorious and .Magnificent. The king of Abyssinia referred to here was not the one (who accepted Islam and) for whom Rasulullah SAW led the funeral prayer. 3) Haakim as quoted in Kanzul Ummaal (Vol.1 Pg.69). Abu Sa'eed Nayshapoori has also reported the Askari narration in Sharful Mustafa from Alama bin Haarith RA. and Kashaati have also reported the narration but from Wayd bin Haarith RA. is the more famous This narration as mentioned in Isaaba (Vo1.2 Pg.98). Abu Nu'aym has also reported the narration in to emperors of Persia, Rome and Abyssinia as well as to every dictatorial leader, inviting them towards Allah The Glorious and Magnificent. Hadhrat Jareer 3,= in Tabraani and Abu Nu'aym as mentioned in Kanzul Ummaal (Vol.7 Pg.19). (2) Bukhari and others as mentioned in AlBidaaya wan Nihaaya (Vo1.5Pg.lOO). mentioned in Isaaba (Vol. l Pg.382). (1) Bukhari, a s quoted in A/ Bidaaya wan Nihaaya (Vo1.5 Pg.46).